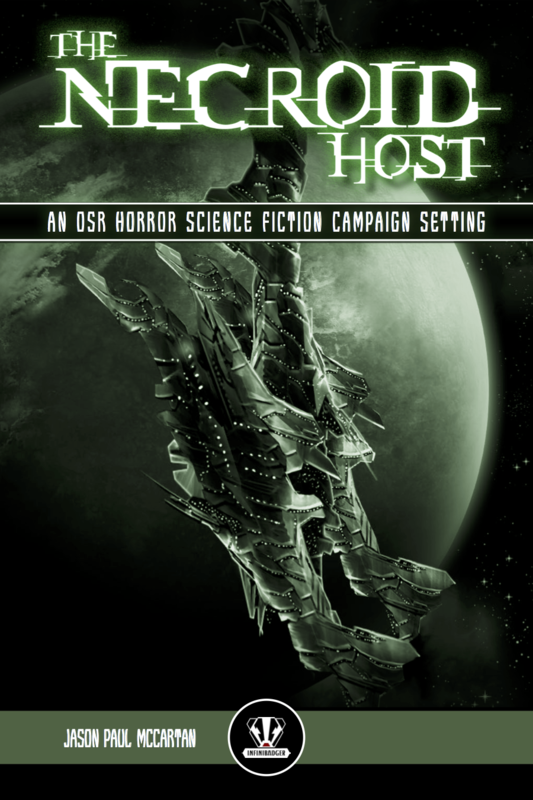 THE NECROID HOST is a sourcebook for OSR games that provides a new and exciting horror science fiction campaign setting that can be run on its own or integrated into an existing science fiction campaign. Millenia ago the Necroid Host was defeated by the Angels, those who had developed special abilities and could fight back against the encroaching horde of demonic everliving creatures. The Angels ulitimately gave their lives to destroy the Necroid Host at their source and save the universe, but the Necroid Host have returned once more to the galaxy. Only those who can discover how to unlock the powers of the previous Angels can help save the universe now! Are you an Angel? Comes complete with an initial starter setting and campaign framework to build on, or simply add to an existing campaign that already exists! The final page count of THE NECROID HOST is estimated to be around 192 pages in size. The book is being published in 6″ x 9″ US trade format. The expected price for this full-color publication will be $15.99 for the PDF version, and $34.99 for the premium softcover or $41.99 for the hardcover.